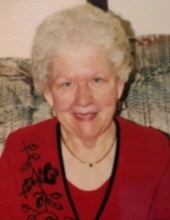 Alma Schmalz, age 87, of North Aurora, IL, passed away peacefully with her husband by her side on Friday, January 25, 2019 at The Tillers in Oswego, IL. She was born August 16, 1931 a daughter to the late Rudolf and Helene (Wittmeier) Weigelmann. She was a member of the Emmanel Lutheran Church, Aurora, IL. Alma met the love of her life Alexander Schmalz and were joined in matrimony on December 28, 1957. Alma is survived by her husband, children, Irene (Joe) Pappa of Oswego, IL, Debbie (Jeff) Heiser of Byron, IL, and Frank (Barb) Schmalz of Montgomery, IL; seven grandchildren, Dustin (Jessica) Heiser, John (Angie) Heiser, Thomas and Erika Pappa, Daniel, Jacob, and Adam Schmalz; a great-granddaughter Hailey Heiser; three sisters, Elsa Schuon, Lydia Schoenbein, and Martha Upton; two brothers, Eduard and Fritz Weigelmann. She was preceded in death by her parents, a brother Ewald Weigelmann; four siblings in infancy during the war, 2 brothers in-law and two sisters in-law. A Visitation will be held on Friday, February 1, 2019, from 4:00 PM until 8:00 PM at DUNN FAMILY FUNERAL HOME with CREMATORY 1801 S. Douglas, Oswego, IL 60543. Funeral Service will be on Saturday, February 2, 2019 at 10AM at Emmanuel Lutheran Church 550 4th Ave. Aurora, IL 60505. Burial will be at Lincoln Memorial Park in Oswego, IL. In lieu of flowers, memorial donations may be made to Emmanuel Lutheran Church 550, 4th Ave Aurora, IL 60505 or St Luke’s Lutheran Church, 63 Fernwood Rd, Montgomery, IL 60538. To send flowers or a remembrance gift to the family of Alma Schmalz, please visit our Tribute Store. "Email Address" would like to share the life celebration of Alma Schmalz. Click on the "link" to go to share a favorite memory or leave a condolence message for the family.